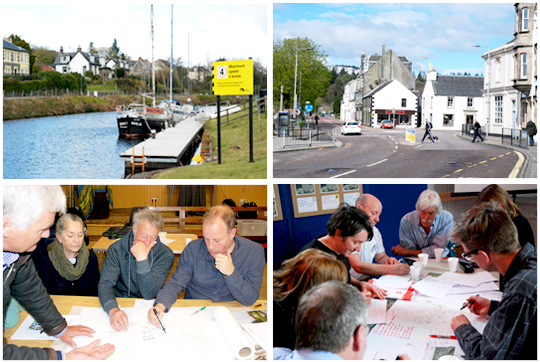 An intricate and complex charrette was held over 4 days, in 6 venues along the Canal, between Lochgilphead, Ardrishaig and Crinan. There was good cross community attendance, with over 200 contributions from residents, businesses and community groups and agencies, in both sunshine and snow! The charrette team was led by Oliver Chapman Architects, with KMA facilitating, Harrison Stevens Landscape and Urban Design, Ekosgen and McIlhagger Associates on transport and DM Hall. The charrette was sponsored by Argyll and Bute Council, Scottish Canals and the Scottish Government. Discussions in the workshop got off to quick start, with many people already having fed in ideas through WAVEparticle’s pre-charrette work. The sequence of KMA facilitated workshops built on these early discussions by drilling down into the reality of the issues and opportunities along the canal corridor while the design team developed plans, sketches and 3-D concepts. Ideas ranged from developing the arts and cultural network to better routes and signing, to a pedestrian friendly streetscape and square in Lochgilhead that shifted it from a place to pass through to a place to stop. Larger scale opportunities came under consideration at Ardrishaig harbour, with discussions about the role of the Gleaner former oil storage site. There is a huge appetite for getting on with a range of projects to build up momentum across the community. The charrette process was documented and summary videos of the event can be viewed here. ← Our analysis on The Planning Review evidence is published.